Do you know the situation when you feel completely stuck, whether with your team, you organization or any group you are a part of? You experience the lack of possibilities and innovation, and it just feels lousy. During our 7 years of working with and for organizations, large and small, in business, government, civil society, and inter-sectoral networks, we figured out that being stuck is not the end of something, but a perfect starting point for the beginning of something profoundly new. Embracing “stuckness” enables us to “think out of the box,” to start to create paradigmatic innovations and to explore different, better solutions. We find the core of this shift in the initiating assumption, do you start from scarcity or abundance? This article is about a simple method that supports groups in making the shift from being stuck in scarcity-driven structures proposed by Economics to abundance-based structures proposed by Ecosynomics. The difficulty seems to be in the direction of the imaginative exercise. It seems difficult to see a better reality from one’s own current reality. It seems to be easier to imagine one’s currently reality from the better (abundant) reality. We figured out that working with concepts that are “out of our current thinking” requires us to build a bridge for people. However, that bridge does not start on the shores of our old or common thinking. Since this scenario sounds “strange” and “not real” to many of our stuck clients, we needed to find a simple and straightforward method to create an understanding of what abundance is and what it is not. Thus, we started to use the Kopfstand (German for headstand) creating an experience of “the world beyond the walls of the box.” By doing so, we challenge mental models and uncover visible and invisible agreements that drive human interactions in the system. Borrowed from processes we use in product innovation and design thinking, the Kopfstand enables the participants to leave their current thinking and look at it from the other side. Image 1: The five dimensions and three levels of perceived reality, as proposed by Ecosynomics. The outer circle represents the experience of abundance and the inner circle the experience of scarcity (leading to stuckness). It is used as the framework to apply the Kopfstand. 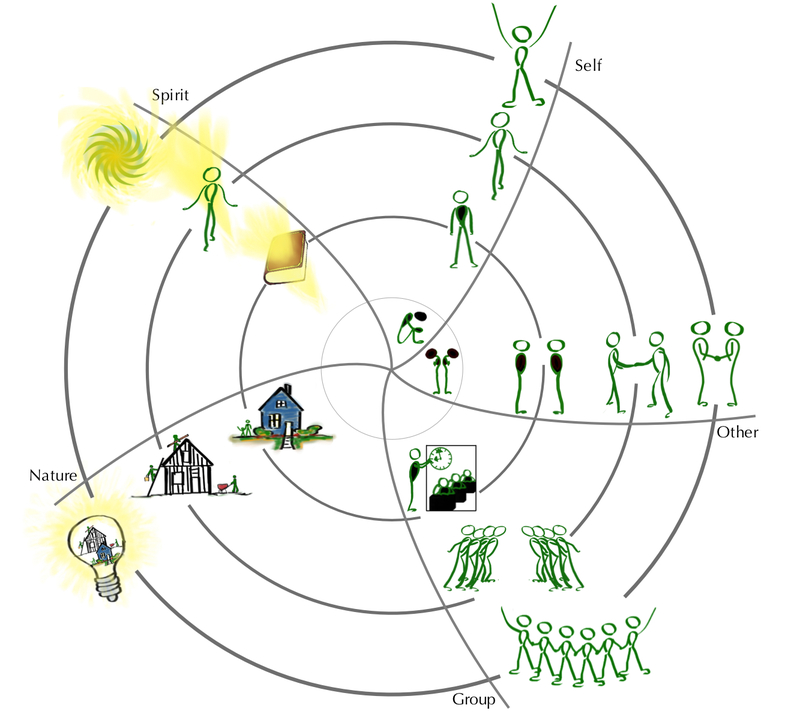 Sharing of scarcity to abundance continuum: We start by sketching the chart of the five relationships and three levels of perceived reality on the wall (see side bar). Derived from Ecosynomics research, it provides a comprehensive explanation of the experience of scarcity and abundance. Why five relationships and why three levels? The literature and years of experience show that any social system consists of at least those five relationships. Try it out for yourself, by asking a person to, “Describe a situation where you felt richness in possibilities for yourself and/ or the group you are in.” We find that people start to describe the situation by unconsciously referring to those five relationships – the relationship to self, other, group, nature, and spirit. Their experience describes one of the circles in the image, ranging from scarce to medium to abundant. Destroying the high-performance organization: “Now your assignment is to lead your organization away from abundance (since it is considered as not business-relevant and sort of “soft”). Please do this step in a team of two. Use your red sticky notes and note down what you can do to destroy the abundance-based reality. Before putting the sticky notes on the graph, discuss your strategies and actions with your teammate.” Within 5 to 10 minutes, people note down ideas and post them on the image. Our experience is that people get really creative and eager to fill the wall. Relating destructive activities with day-to-day experiences: Once completed, we ask people to read out and explain their ideas. Destructive and inefficient behaviour as well as dysfunctional organizational structures are described. Most of the actions and strategies are characterized by ingratitude, angst, apathy, mistrust, and anti-social competitiveness. At this moment we often experience a radical shift happening. As the list continues, people start to see that they are actually describing their own organizations. On the individual level, people react with either silence or contemplation. Others burst out laughing, since they know this kind of behaviour just too well. Some protest by saying, “Who would ever want this? Why would I choose to work this way?” Many participants note, “We just described our organizational context. It hurts, and I just got clear that it is the scarcity-based mindset that leads us to the agreements creating this kind of inefficient and ineffective organization.” There are always a few that say, “Finally I understand why my organization is so effective, innovative and efficient.” If you have such a statement we recommend using their stories as benchmarks throughout the rest of the workshop. At a group level, people start to realize that they are not alone with their experience of scarcity-based agreements and decision-making. The Kopfstand method helps to create a container of understanding and allows for group reflection from a completely different standpoint because you start from an experience that everyone in the room has. The method gives an intuitive frame that helps to see the concept of relationships based on assumptions of abundance. The findings of Ecosynomics are much easier to understand this way, because participants describe the circles and relationships unconsciously in their own stories. When you start to gather the voices of the whole group and someone else says something that you also had in mind, this creates a whole picture of an organization. However, it is important to avoid finger-pointing and assigning statements directly to a specific organization. People should be empowered to state their ideas and thoughts themselves instead of you presenting them with their unhealthy proposals. Participants thus have the chance to have their own experience of abundance and scarcity in that very moment and deduct their own conclusions about the concept. The method has been applied in this way in dozens of different settings throughout Germany, Ghana, Mexico, The Netherlands, Romania, South Africa, United Kingdom, and the USA. It has been applied in different sectors and with very different target audiences with amazingly similar effects. In case you want to take the next step, we propose to continue with a Doppel-Kopfstand or reverse scenario to identify measures of how to improve the situation once the underlying assumptions have been changed. A personal experience with an abundance-based reality can help people to start questioning and changing existing agreements about how they relate to oneself, others, groups, innovations, and creativity. Be careful… our experience shows that people start to find they no longer agree to work in unhealthy and scarcity-driven environments. I am happy that James Ritchie-Dunham, ISC President, has been invited to the BUILD UPON advisory board, contributing ecosynomic thinking to the project. In June 2014, Christoph Hinske, an ISC Senior Fellow based in Germany, was invited to meet with Prof. Dr. Lars Castellucci, a member of the German Parliament, Abdul-Rashid Hassan Pelpuo, the Honorable Minister for Private Sector Development from Ghana, Joe Tackie CEO of the Private Sector Development Strategy at the office of the president and representatives of the Friedrich-Ebert-Stiftung Foundation. The meeting was a success, and Christoph was invited to Ghana. Members of the panel, ranging from ministries, companies, worker unions, academia, donor agencies and youth organizations started to see actionable pathways of how ecosynomic principles foster balanced and inclusive economic development in Ghana. Now a small and impact-driven group of academics led by the Department of Economics at the University of Ghana, will use the facilities of the Friedrich-Ebert-Foundation to design a Ghanaian project. Spanning all industries, this project identifies, connects, shares, and scales insights gained from Ghana’s positive economic deviants, “natural experiments” in abundance-based ecosynomic agreements, and unites them in a national multi-stakeholder economic development process. Christoph Hinske, an ISC Senior Fellow based in Germany, just met with Prof. Dr. Lars Castellucci, a member of the German Parliament, Abdul-Rashid Hassan Pelpuo, the Honorable Minister for Private Sector Development from Ghana, and representatives of the Friedrich-Ebert-Stiftung Foundation. This exciting exchange highlighted ways that Ecosynomic principles could foster private-sector development in Ghana. As a direct result of this meeting, we are now invited to explore possibilities of how to find, empower and multiply positive economic outliers in Ghana. As follow up, the Friedrich-Ebert-Foundation invited us to share our research, case studies and approaches at the Ghanaian Panel on Economic Development in September. Just today, while accompanying my daughter in her first day in kindergarten, I had an experience of how to invite others into our work. I met another parent, and we had a 10-minute conversation. He asked me what I do for work. I reflected right away on a conversation I had the day before in one of our “global vibrancy network circles” on how to best frame our “work” for specific target groups. The father I was talking to works as a state-certified assessor and instructor for future teachers in German schools. Thus, I told him that I am working as a freelancing assessor of organizations, currently focusing on finding abundant educational forms. His eyes lightened up. When explaining what I do, I did not use the term abundant, but used my hands, and asked him if he knows schools that, when he enters the building, he feels either “yuck“ or “yeah.” I reinforced these words by rising my left or right hand and doing a body gesture (scarce/ abundant). He was very convinced that he had had both experiences, giving me several examples of each. I went on, mentioning that we are working globally to identify the “yeah-schools.” I also shared that we have started to find them in many didactical traditions, cultures, and countries. I actually did not say much more nor did I use any specific wording or knowledge. He was thrilled. As he was leaving the kindergarten a little later, he passed by and asked me to contact him if we want to search for schools in Germany, as he would be happy to be part of this project. I told him I would love to do so, and that we are currently setting up the structures to invite people like him to participate. He smiled. We are on the edge of redefining what “good education” looks like, independent from educational approaches. The importance of the reflective space that I have with the global vibrancy network. The importance of searching for the possibility to “give target-group-specific elevator speeches“ and share our work. People are thrilled to contribute to our work. The power of our work since we are addressing a pain that nobody else is having a “pain killer’ for… we might have one. 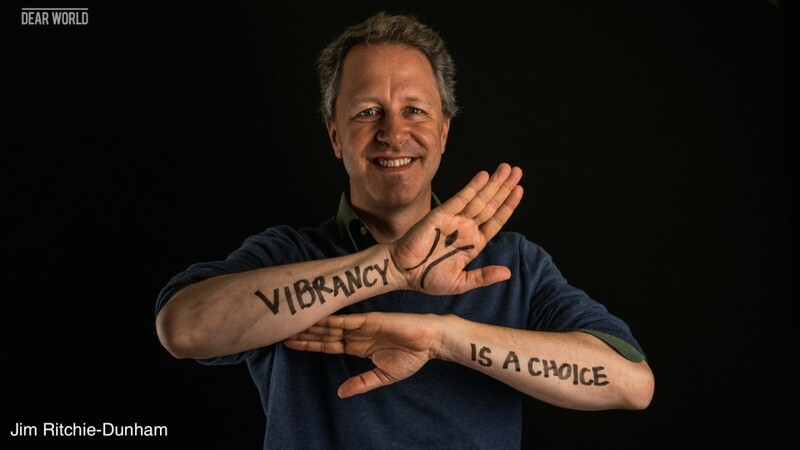 Note from Jim: Please share stories with me about experiences you have had with sharing the work of Vibrancy and how you engaged others in it. In my work over the past years with the Ecosynomics framework, I have taken very distinct pathways to integrate and experience the material and make it part of my worldview. I did so because I firmly believe that a framework is only as good as it effects my reality and inspires my own thinking and acting. Accordingly, I tried to apply and reflect on the impact of the framework on a frequent basis. After a while I started to understand that the framework itself is a powerful aid to see the world in a completely different way than what I had been taught to see. This learning and integration process has not always been easy. I had to unlearn some major things, like starting with assumptions of scarcity rather than assumptions of abundance. You can bet that trying to understand the infinity of the universe gave me a similar headache (the universe still does so). In this blog post I want to share some of the practices and interventions I have used to unlearn and learn. My intention is to inspire and challenge to take on a similar process for yourself. While the whole Ecosynomics framework felt intuitively right, in the beginning it was mostly abstract theory to me. But, since I firmly believed that the Ecosynomics research and work was not just “another nice theoretical framework to make my money as a consultant,” I tried to dive as deep as I could imagine and noticed that I took the red pill as Neo in The Matrix http://www.youtube.com/watch?v=zE7PKRjrid4. I noticed that my imagination (of what is possible) was just a small fraction of what is actually visible if applying the right lenses. The following practices helped me to dive, integrate, and yes… also start make a living out of the research. See if you have contacts in small publishing agencies, magazines or specialized journals. Ask them if they are interested in interviewing you about our research and how it relates to their focus. Thus, you have minimum amount of work, and they have an exciting and cutting-edge story. This is how I got an amazing interview at Tattva Viveka (see English translation). Additionally, I started a great relationship with wonderful people bringing out an impactful magazine I did not know before. See if you know people that organize conferences addressing a rather closed or specific community related to the research findings and your deeper interests. Thus, a wonderful friend of mine proposed me as a speaker to the organizers of the Berlin Change Days 2013. The conference targets consultants and people generally interested in the dynamics of change. It is a very casual and “unofficial” conference hosting a passionate and committed community of people from around the globe. Approach contacts you have in smaller universities that are interested and in the need for cutting-edge research and hands-on cases. Small universities are often very interesting places for “magic to happen.” I did so with the University of Sustainable Development in Eberswalde. I started my relationship by offering to give a presentation of our research and to do a “simple” Harmonic Vibrancy assessment of the course group I would work with. They were very open and interested. The students took the survey in advance and received hands-on insights of cutting-edge research of a Harvard and EGADE-associated research institute. They experienced a process that would normally cost between 15.000 and 18.000 Euros (my European rates for business clients). The relationship even developed further and one of the professors was very excited to reflect on how the work with the framework both increases the student’s ability to perform and increases their chances in a very competitive job market. You can see the interview in one of the later chapters of the Ecosynomics online course. If you would like to offer such an interactive diagnostic and course, I can provide you with anything you need: invitation mails to students, ppt presentations, group dynamics and you could even compare the results of your course with my courses or also with the courses of other ISC fellows. A few days after the interview, the Prof. offered me another job and invited me to co-create a specialization branch within the study program that will focus on Ecosynomics. Ask friends and clients if they are interested in having a 1-2 day introductory course on the research and findings in exchange for a donation to the Institute for Strategic Clarity. I focused the course on reflecting and finding ways for them to apply the framework and findings in their concrete contexts. Out of these courses many recommendations emerged. One led me to do a 3-day strategy workshop and another to do a well-paid interactive speech at a university. Look for contacts in smaller consultancies working on innovation, performance, creativity and group dynamics. Many of them are struggling with integrating the benefit of their work into business-relevant matrixes. With the “costs of scarcity” framework you can offer a powerful and yet simple painkiller for their pain. You might want to offer them 1) to given them train-the-trainer sessions and deeper-dive intensives, 2) to accompany them in the process, and finally 3) to connect them to the bigger community of the ISC. I have had many good experiences using this three-step process of engagement and the first contacts are already moving into step 3. For me this is the most exiting part since they start being independent of my input. In the last 6 months, I successfully did so with 5 organizations. Invite your contacts into conversations around your work with the frameworks (meetings, calls, Skype etc.). While I still have not generated much revenue out of these possibilities, they helped me to tell a concise story (which is worth gold). And, some of them have recommended me into their networks and arranged meetings with their clients. I started to understand that my first circle contacts are mediators to get in contact with future clients. One of the results is that I was able to realize a project for the major German player in the field of international cooperation. Another result is that several of my friends have started working with the Ecosynomics frameworks and engaging me in their projects. Contact smaller industry associations. Most of them are struggling to continuously create new offers for their network members. Offer a gift-based speech or introductory course. I did so and now have started into my 2nd year of working with one in Germany. Offer first and simple diagnostics (only the online version) to your contacts. The Institute for Strategic Clarity is happy to provide you with the basic materials you need (letter of invitation etc.). Other colleagues at the Institute and I are happy to guide you through your first analysis of the data. It is around 2 days of content-related onsite work for you. The rest depends on the quality of the relationship you develop with your contact. I experienced it with good contacts to be 3 days over a time horizon of three weeks. You could either present the results online or get invited to do it in person. This is how I started to earn around 20.000 Euros in just a few months, get great contacts, position myself and learn of how to frame it in front of different audiences. These are eight of the ways I have taken on the practice of applying and reflecting on my own use of the Ecosynomics framework over the past few years.